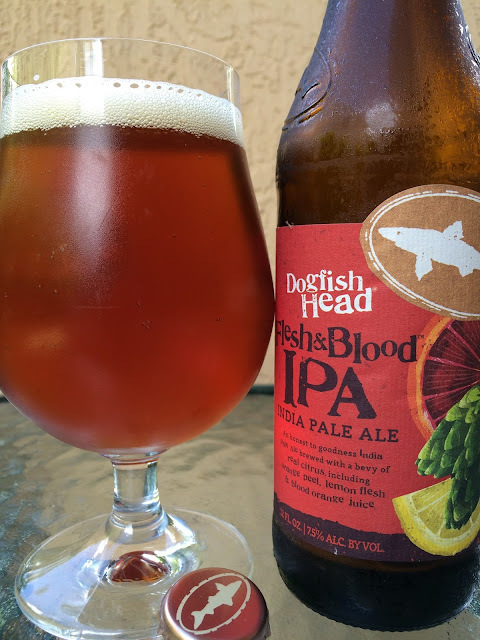 Dogfish recently brewed a new beer called Flesh & Blood IPA. This IPA is brewed with orange peel, lemon flesh and blood orange juice, all prominently featured on the label. 7.5% alcohol. Lemon and orange aroma, though I really had to work for it. Juicy orange aroma does show more with some warmth. Lemony flavors in the beginning followed by a rush of orange, a combination of both juicy and bitter zesty rind. Fruity, nice bitterness, both play well together. Also great carbonation. Blood orange flavors really linger long after each sip. Interesting and unique as usual. Balanced and pretty good, though I prefer 60/90 Minute to Flesh & Blood, which for me leans way more fruit beer than IPA.